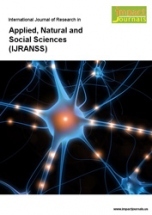 IMPACT: International Journal of Research in Applied, Natural and Social Sciences (IMPACT: IJRANSS) is an open access, double blind, peer-reviewed and refereed journal in English in the areas of natural and applied & social sciences , published monthly by Impact Journals in the form of electronic version. The scope of the journal includes biological sciences, biodiversity, biotechnology, clinical sciences, animal and veterinary sciences, agricultural sciences, chemistry, Health Sciences, environmental sciences, physics, medicine, nursing, mathematics and statistics, life sciences, geology, social sciences, nano technology, space sciences etc., It is a scholarly journal of opinion and research in academic research. Its mission is to provide an interdisciplinary forum for discussion and debate about academicians researches most vital issues. The focus of the publication is original completed research that has application to academicians, researchers, policymakers, administrators, and teachers within the broad areas of academic research.